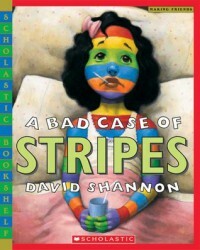 This story is about a little girl name Camilla who wakes up with rainbow colorful stripes. She does not like her stripes and wants them to go away. Camilla tries different medicines and procedures to get rid of the stripes. Finally, a lazy suggest that Camille eat lima beans. The lima beans made the striped go away and Camilla enjoyed eating lima beans. This would be a cool story to read to students and allow them to try lima beans.